We’ve been waiting for hours to board. All flights are delayed indefinitely. Our plane has been diverted to Sandakan to wait out the storm and crowds from later flights kept pouring in by the hour. There weren’t enough seats for everyone. Many sat in groups on the floor, many more remained standing, while others crowded into stores to kill time. With hardly any space to move, the rising level of noise and crying babies, everyone was getting restless. Everyone, it seems, except me. I was quietly feeling good about myself. After making it to the top of Mount Kinabalu and back, I can do anything! I can totally handle this! 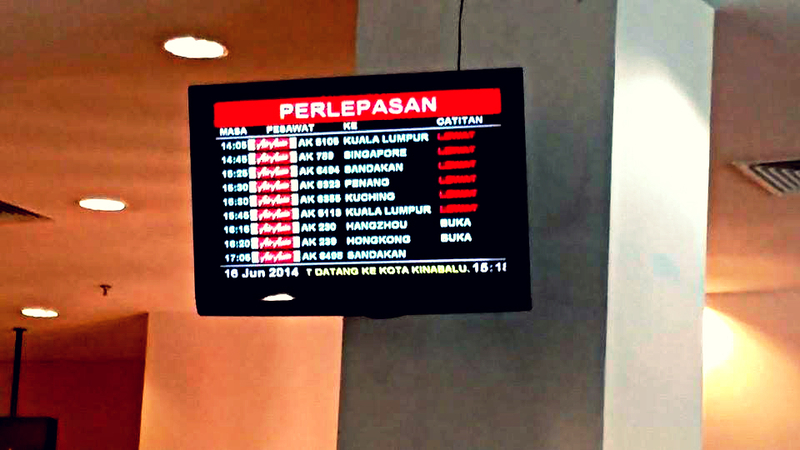 For the first time, I am not annoyed at Air Asia or aggravated by the long wait. I am enjoying listening to other climbers swapping stories of their hike. I was even grateful that the delay had caused me to stray into a store and find a gem of a book by Paulo Coelho, ‘Like the Flowing River’, which I was now reading. I felt calm like a river! By this time, my phone had died and I’d like to charge it. But I didn’t want to vacate my precious seat for nothing. So I’m staring at my cousin scrolling through her phone, fully charged. She had found the charge point. I wanted to know its exact location, but that was all the help I got. What does she mean by ‘there on the left’? How am I supposed to see that hole in the wall in this crowd? Suddenly, many hours of perfect Zen gave way to instant irritation to the highest degree! It’s like Life wanted to show me, “So you think you’re so tough? Here, take this!” It was a test. My cousin continued scrolling through her phone in perfect calm, oblivious to my offended ego, which demanded an answer that instant. That was her answer. Why was I feeling so much anger, over such a small matter? When I asked that, I got myself an answer, in rapid-fire no less. I realized I’m the one who is just sitting there, too afraid to move and find the charge point for myself, from fear of my own poor sense of direction! Another cousin of mine had ventured out earlier to find a charge point. While she was charging her phone, W had gone off to find her, and in the process, discovered the charge point for herself. Nobody told them where it was. They found it on their own. Why couldn’t I do the same? Who’s the lazy one now? Ooops! There’s no harm in asking for directions. But sometimes directions are just that. It directs you. It points you “THIS WAY” but the rest of the details is your adventure and up to you to discover for yourself. I was too lazy to get off my seat and projected my laziness and poor directions on W. In truth, I feared my own tendencies of getting lost! At first, that radical idea struck me as bizarre! I’ve written about it here: Owning my Shadow / Taming my Dragon. After the initial shock, the truth of it began to reveal itself to me–and it’s still revealing itself till this day. “Projection is a fascinating phenomenon they failed to teach most of us about in school. It is an involuntary transfer of our own unconscious behavior unto others, so it appears to us that these qualities actually exist in the other people. When we have anxiety about our emotions or unacceptable parts of our personalities, we attribute these qualities—as a defence mechanism—to external objects and other people. When we have little tolerance for others, for example, we are likely to attribute the sense of our own inferiority to them. Of course, there’s always a “hook” that invites our projection. Some imperfect quality in other people activates some aspect of ourselves that wants our attention. So whatever we don’t own about ourselves we project onto other people. We see only that which we are.” – Debbie Ford, ‘The dark side of the light chasers’. At the clear realization that I was projecting my own personal traits on my cousin, the hot flash of irritation vanished! I felt a little embarrassed for me of course. These kinds of awareness aren’t easy on the ego. But there was no more reason for anger, so I felt free and light as a feather! I decided to leave my phone uncharged and happily continued reading instead. Perhaps I passed the test. Perhaps I really can endure anything after the climb up Kinabalu. BUT. My lesson for the day is far from over. The hilarity of what ensues later must be shared in ‘My Projection Of You Is A Reflection Of Me – Part II. I’ll leave that post for another day.